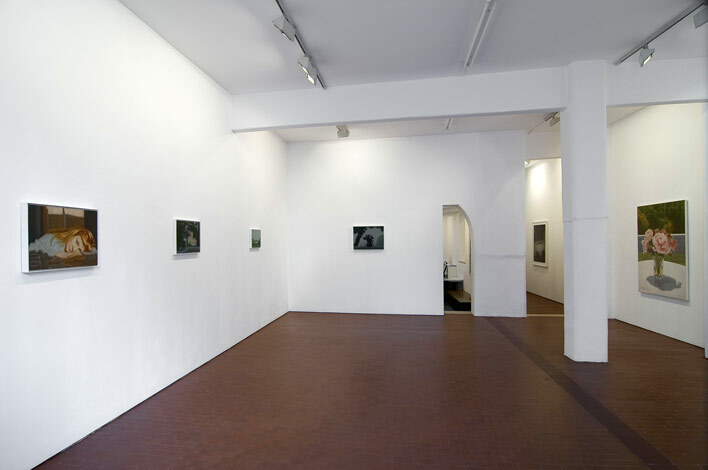 Russian artist Matvey Levenstein presents his second personal exhibition at Galleria Lorcan O'Neill Roma with a group of new oil paintings on canvas, paintings on copper and century to create intensely smooth and luminous surfaces, and two large sumi paintings (a rare ink wash painting technique originally from East Asia). His new works are Long Island landscapes (the grounds of the American Pilgrim Fathers), still lifes with flower arrangements, and images of Roman church interiors, often captured before the action of the day begins. The suspended, melancholic atmosphere they evoke seem to stream unconsciously from the artist Russian childhood and make each painting a meditation on the past and the present. Levenstein is one of a number of artists (John Currin, Lisa Yuskavage, Richard Phillips) who studied at the Yale School of Art and cultivated a deep common interest and understanding of Painting; they inspired one another but each developed his own style. Levenstein possesses, like his peers, exceptional technical talent; a master of underpainting, constantly drawing inspiration from the Italian painting tradition, he is a slow and methodical artist and often takes various years to complete a work. The effective use of light and shadow to create mood is central to Levenstein methods. Twilight (an emblem of melancholia and solitude), and the soft lightly coloured shadows it casts, play symbolically powerful roles in Levenstein's paintings, which visibly share Vermeer's sense of light In focusing primarily on quiet moments, Levenstein employs a form of realism which has something in common with the tradition of 19 century American painting, but his technique is completely different, and with his distinctive approach, he creates new ways of viewing painting, with complex yet classic composition and themes, and a new profound sense of suspension and inner reflection.